Sold over asking with multiple offers in 10 days! Located at the famed “Somerset Building” with 1st class amenities. 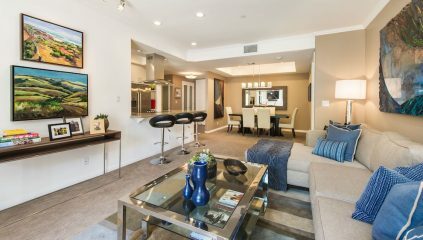 This luxurious Penthouse has total privacy and is updated and remodeled throughout with an open kitchen with an oversized counter to the dining & living rooms with a gas fireplace. The eat-in kitchen has access to the terrace that extends from the kitchen, living room and to the master bedroom. The split bedroom floor plan offers privacy with a large en-suite Master bedroom . The bathroom has dual sinks, separate shower & soaking tub. The 2nd Bedroom has a full bath/shower combo and the private laundry room has a full-size washer and dryer plus storage. The HOA monthly dues include Earthquake Insurance, Gas, Water, Directv with HBO, and high speed internet. As of 2019, hard floors may be also installed in the living and dining rooms subject to proper installation and sound proofing approval. Owner parking spots come with built-in electric vehicles (EV) charging station. Located on a quiet tree lined street, amenities include a beautiful remodeled lobby and hallways, 24 hour concierge, valet parking, gym, pool, spa, sauna & banquet/party room. Email or call me for showings!